The Ogre” sent me a photo I figured had to be an Aprils Fools’ prank, and I wasn’t going to fall for it. “The Ogre” is a fellow land surveyor who specializes in historical document research. He spends so much time in the dusty vaults and basements of buildings that house old public records that we started calling him “The Ogre who lives under the Archives” — kind of a twist on the old children’s fairy tale about three billy goats that couldn’t cross a bridge because a mean ogre lived beneath it. The old black-and-white photo that The Ogre sent me was a picture of a newer bridge with an old bridge in the cavity beneath it. No way anyone would ever construct a bridge over a bridge like that, I reasoned. I suspected some sort of computer Photoshop trickery had been done to the photo, so I called The Ogre and told him I wasn’t buying into his April Fools’ joke. The Ogre assured me it wasn’t a prank and that the picture hadn’t been Photoshopped. He had stumbled upon it while researching for something else so he knew little about the picture, but the back of it read, “Alton – 1969.” The photo raised a lot of questions and didn’t offer many clues. Why would you build a bridge over a bridge? How did they do that and when? Where is, or where was it? Is it still there? How hard can it be to find this odd double-decker bridge? The Ogre and I decided to find out and began poking into the mystery of the bridge. 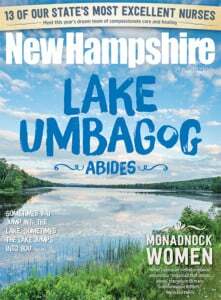 The newer bridge on top appeared to be the kind of standard bridge that the New Hampshire Department of Transportation built on secondary roads all over the state. Probably not a town bridge on a town road, I reckoned, so I called another surveyor colleague who works for NHDOT. I showed him the picture, and asked him what NHDOT had for old records on bridges in Alton. He gave me a tall stack of files to peruse. Somewhere in the pile I found a second photo of the bridge, this one in color. The back of this photo indicated a New Hampshire route number and the name of the brook. Looking at the route on a USGS quadrangle map, I noted that it zigzagged back and forth across the brook a small number of times, meaning that there were only a few possible locations to investigate. The Ogre called a historian he knew in Alton and inquired about the most likely locations. A road trip was deemed necessary to explore suspected locations, and everyone involved wanted to go. So looking something like the clown car at the circus, one Saturday morning the DOT colleague, the historian, The Ogre and I piled into a tiny car and went looking for this mysterious bridge. We found it on our first stop. With two of my questions (where is it, and is it still there) now answered, the why did they build a bridge over a bridge remained. The DOT colleague had found the engineering design plans, which were dated 1929, and they clearly indicated that the existing bridge was to be retained during the construction of the new bridge. 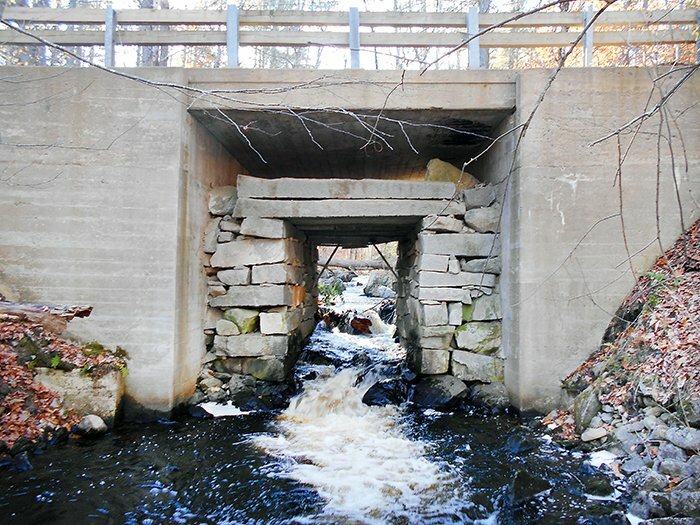 The historian told us that he found town records indicating that the bridge had been replaced in the 1929 time period, but no paperwork indicating why it was built around the lower bridge. The historian had also asked many old-timers in town about it, but no one remembered or had a very definitive answer. One local suggested that they were trying to save money by building around the old bridge, but usually the most cost-effective method is to tear everything out and start from scratch. Contractors prefer to start new, rather than try to save ticklish unstable rock abutments as you gingerly excavate around them. Fabricating and pouring concrete into one-sided forms is more time-consuming than simply erecting conventional two-sided concrete forms. We ruled out saving money as a reason. Another local suggested that instead of providing a temporary detour during construction, perhaps the old bridge could have continued to be used by traffic during construction if left in place. That didn’t seem likely to us either, as the new taller abutments would create one helluva speed bump until the new deck was ready for traffic. An elderly gentleman driving by in an old pickup truck stopped and asked me what we were looking for. When I told him what we were up to, he informed me that back in 1928 his father had hauled fill for the new bridge project building up the approaches for the then-proposed new bridge. His father had been hired because he owned a truck in 1928, back when most of the fill hauling was still done with horse and wagon, shoveling fill by hand onto and off of the wagons. “But, why the bridge over the bridge?” I asked him. It turns out that the old bridge was saved for history and no other reason. There was a contingent in town that just couldn’t bear to see the historic laid-up granite deck and abutment bridge torn down, even though it was falling in, unstable, and could no longer support the increased traffic, faster speeds and heavier, wider loads. A compromise was struck by building the new bridge over the top, swallowing up the old bridge and costing more, but also saving the old bridge from demolition. Thus, the old structure was preserved for history, but ironically, the reason why it was saved was almost lost to history, until three surveyors and an ogre came across the mystery.